Peter Martin: OUR CURIOUS STASH: We're loaded with cash. Except that most of us aren't. OUR CURIOUS STASH: We're loaded with cash. Except that most of us aren't. We now have money than ever - literally. Although many of us mightn't realise it. 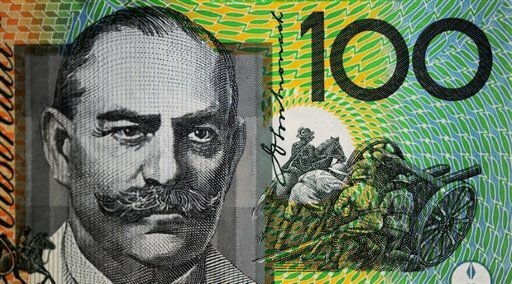 Officially each Australian now has on hand or on demand at banks and shops an average of six $5 notes, four $10 notes and six $20 notes -- totals that are little changed in years. But our holdings of $50 and $100 notes have exploded since the financial crisis as the Reserve Bank has pumped into circulation an extra 72 million and 30 million $50 and $100 notes, pushing up the number of $50 notes from 18 to 20 per person and the number of $100 notes from 8 to 9 per person. If those totals strike you as unlikely it could be because you are lacking experience in high-finance or the cash economy. Or it could be because you haven't kept up. A decade ago there were roughly equal numbers of $20 and $100 notes per person, a fact that by itself might have seemed unlikely to those of us who would have had trouble even identifying the colour of a $100 note. 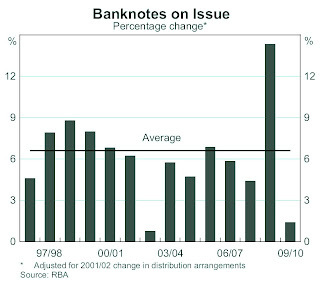 But demand for $100 notes took off with the the introduction of the Goods and Services Tax ten years ago and reached fever pitch in the financial crisis when the Reserve Bank boosted cash on hand by a record 14 per cent in order to ensure banks and ATMs could meet demands associated with the stimulus and the desire to actually store money in briefcases or in shoeboxes under beds. Adding weight to the theory that many or most $100 notes are stowed rather than put into wallets are Reserve Bank estimates showing $100 notes should last around 70 years before becoming damaged, whereas $20 notes should last 12. The Bank's annual report reveals that after the crisis our demand for cash didn't slacken, suggesting a permanent or semi-permanent step up in our holdings of cash as a result of the crisis. So concerned was the Bank that we get access to cash in 2009 it opened a new distribution point for notes at its head office in Martin Place, literally across the road from the main bank branches in addition to its distribution centre at Craigieburn in Victoria. It passed on to banks and ATM operators its advance knowledge of where and when stimulus payments would be made so they could order extra cash and place trucks on standby. Our growing love affair with cash hasn't led to an explosion in counterfeiting. The Bank found only 7800 fake notes last financial year, no more than normal and a much lower rate than in other countries. 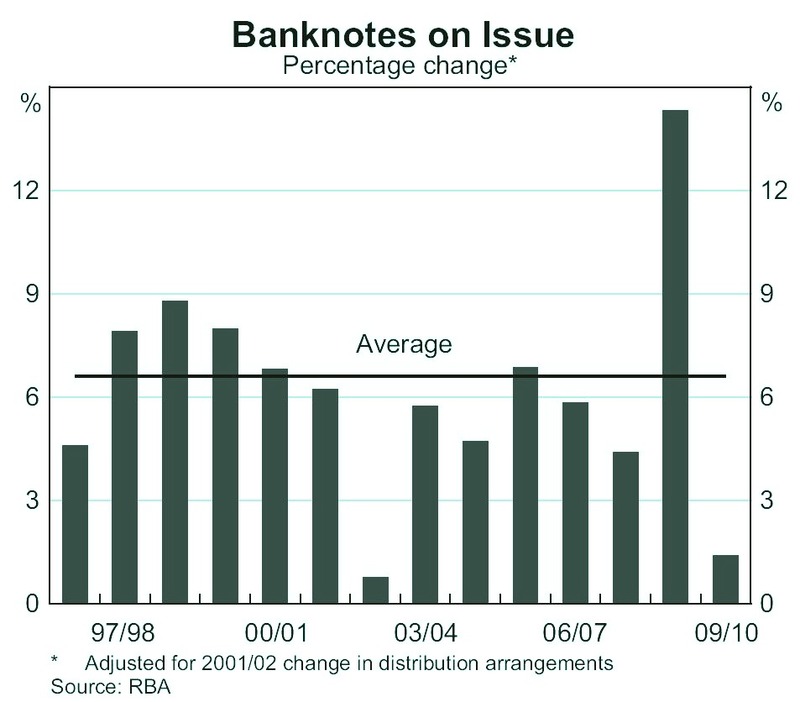 Almost all were copies of $50 notes.
. More $100 notes than $20 notes?
. Where the hell are our $100 notes? Flat growth but better than ever? Let's celebrate. Telstra will be split! Don't wish too hard. Ralph Norris on bank costs. Four easy pieces. What the OECD actually said. Google does something really good. Rates up. No sweat. This time. For now. Things are good. So Treasury's worried. The Reserve is ready to hike. It might.